It’s easy to forget that the past not only looked different to the present, it tasted different too. 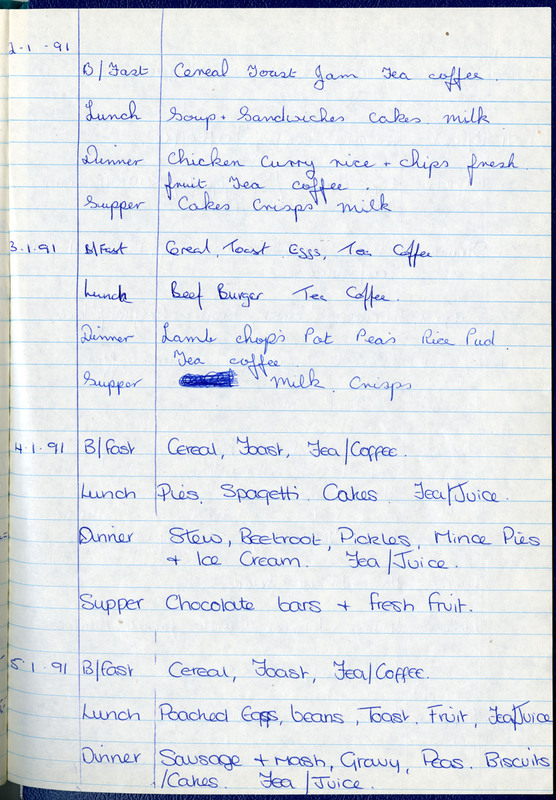 In today’s post we’ll take a look at some dietary diaries to see how people’s diets have changed over the past 60 years. 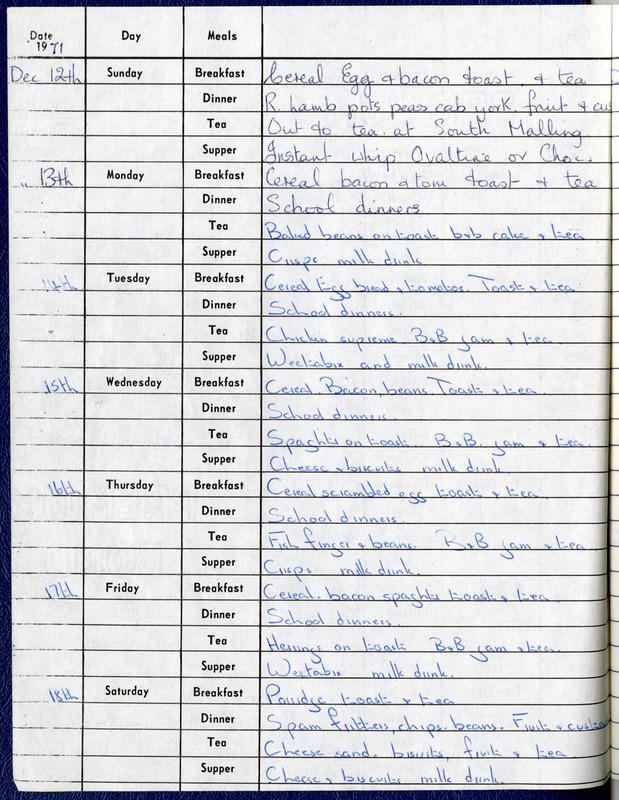 The first dietary diary I’m going to share with you today comes from St Agatha’s Home for Girls in Princes Risborough, Buckinghamshire, and dates from 1955. Breakfast – Swiss porridge. Breakfast sausage B&B marm. tea. Tea – Banana jelly. B&B. jam. cake. Tea. Supper – Bread & dripping. Milk. Breakfast – Cornflakes. Tomatoes & fried bread. B&B. marm. Tea. Tea – Mince, peas and carrots. B&B. jam. Gingerbread. tea. Breakfast – Swiss porridge. Scrambled egg on toast B&B. marm. tea. Tea – Shepherd’s Pie with baked beans. B&B. jam. cake. tea. Supper – Cream crackers & cheese. Milk. Breakfast – Puffed wheat. Bacon & fried bread. B&B. marm. tea. Tea – Sausage & tomato pie. B&B. jam. cake. Tea. Supper – Jam tart. Lemonade. Breakfast – Porridge. B&B. marm. tea. Tea – Grated cheese. beetroot. tomatoes. carrot. B&B. Jam. Birthday cake. Tea. Breakfast – Cornflakes. Bacon & fried bread. B&B. marm. tea. Tea – Smoked haddock. B&B. jam. Biscuits tea. Breakfast – Puffed wheat. Scrambled egg & fried Bread B&B. marm. Tea. Dinner – Roast mutton. Roast & boiled potatoes. Cabbage. gravy. Junket. Tea – B&B. paste. Almond buns. Tea. Supper – Buns & milk. A lot of this food may seem rather conservative now: cooked breakfasts and fish on Fridays, all eaten with lots of bread and butter. However, this was a time when food rationing had just ended in the UK so you can imagine that many of the items here, like banana jelly, would have been quite exciting for the children eating them. There doesn’t seem to be much processed food in this diet, with the notable exceptions being breakfast cereals, paste, baked beans and cream crackers. It’s also to interesting to note just how much tea the children were drinking, which is not necessarily a drink we associate with children these days. And if anyone has eaten Swiss porridge or junket, I’d love it if you could tell me a bit more about them in the comments! 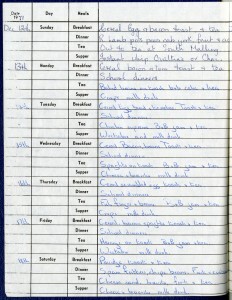 The next diary we have comes from the Harvey Goodwin Home in Cambridge and dates from 1971. Supper – Instant whip Ovaltine or Choc. Tea – Baked beans on toast b&b cake & tea. Tea – Chicken supreme. B&B jam & tea. Supper – Weetabix and milk drink. Breakfast – Cereal. Bacon, beans Toast & tea. Tea – Spaghti on toast. B&B jam & tea. Supper – Cheese & biscuits milk drink. Breakfast – Cereal scrambled egg toast & tea. Supper – Crisps milk drink. Breakfast – Cereal. bacon spaghti toast & tea. Tea – Herrings on toast B&B jam & tea. Supper – Weetabix milk drink. Tea – Cheese sand. biscuits, fruit & tea. In this diet we begin to see the rise of processed foods: fish fingers, spaghetti on toast, crisps, instant whip and Ovaltine. Baked beans and breakfast cereals also seem to be eaten with more frequency than they were a decade and a half before. And then there are some foods that seem to be very much of their time, such as chicken supreme and spam fritters! Do you remember those? That said, there are similarities with the previous diet. A lot of bread and butter is being eaten and a lot of tea is being drunk; roast meals are a weekly occurrence; fish is eaten on a Friday; and there is always a cooked element to breakfast. 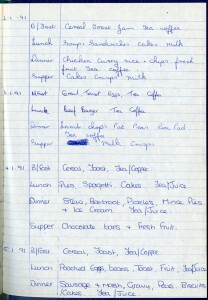 Our last diet dates from 1991 and comes from the Pimlico Road Home in Clitheroe, Lancashire. B/Fast – Cereal Toast Jam Tea coffee. Lunch – Soup & Sandwiches cakes. milk. Dinner – Chicken Curry rice & chips fresh. Fruit Tea coffee. Lunch – Beef Burger Tea Coffee. Dinner – Lamb chop’s Pot Pea’s Rice Pud. Tea coffee. B/Fast – Cereal, Toast, Tea/Coffee. Lunch – Pies. Spagetti. Cakes. Tea/Juice. Dinner – Stew, Beetroot, Pickles, Mince Pies & Ice Cream. Tea/Juice. Supper – Chocolate bars & fresh fruit. Dinner – Sausage & Mash, Gravy, Peas. Biscuits/Cakes. Tea/Juice. 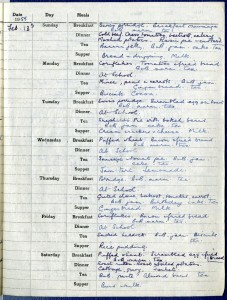 You might notice that by this time the standard printed dietary diary books have gone and that the staff have had to draw up their own book. This means that we can now see a difference in the names of the meals; ‘tea’ is gone and ‘lunch’ has suddenly appeared, pushing ‘dinner’ into the slot that ‘tea’ used to take. Of course, the names of meals can differ by place as well as by time, so there’s nothing to say that these names were in country-wide use in the 1990s. As for this diet, we can see some less traditional food creeping in, such as curry and rice. Beef burgers are also present while a cooked breakfast in the morning and the ubiquitous bread and butter are almost completely lost. The availability of coffee in the morning is interesting, but this may be down to the age of the children in the home rather than the decade. All in all, though, there is not too much to separate this diet from the diets of the 1970s and 1950s. 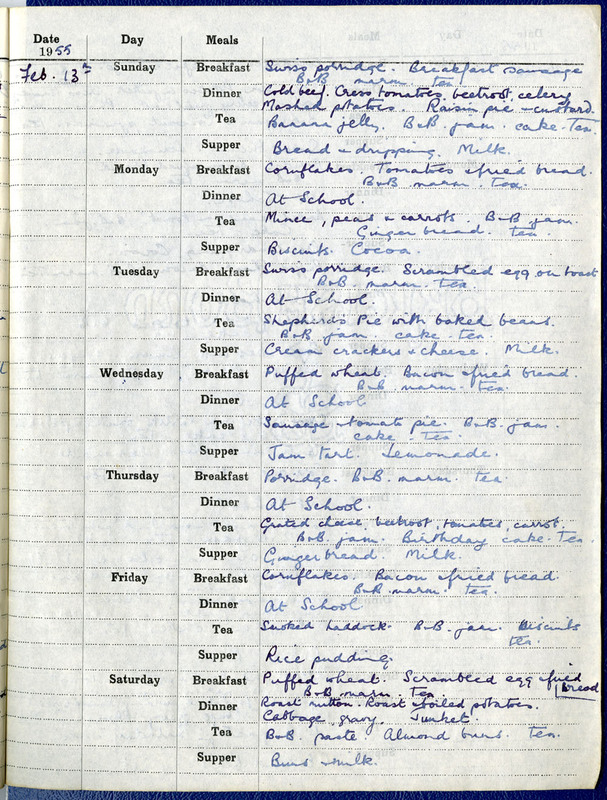 Main meals are often made up of ‘meat and two veg’; tea is given to the children throughout the day; and supper is regularly made up of something sweet and a milky drink. It would be interesting to know what this sort of diary would say today. Do these diets represent how the population ate as a whole or were the meals cooked in residential homes slightly different to those eaten in other households? A point we mustn’t forget is that diet can vary by region and by age as well as by the time-period, so it’s not possible to conclude that the differences between these three diets are based on the decade alone. It would be worthwhile, therefore, to take diaries from the same year for several different homes and see if there was much variation between them. If you’d like to share your experiences of any of these foods in the comments, then please do. Or perhaps you know some other foods that bring back memories of a certain era. Arctic Roll, anyone? James was an orphan. He was born in Oxford in 1886 where his father worked as a guard on the railway. James would have been about two years old when his father died from heart disease. After the death of James’ father, James’ mother found work as a nurse for a family living in East Grinstead in Sussex. Then, when James was about seven years old, James’ mother moved the family to Westminster in London where she started keeping a lodging house. Unfortunately, two years later in 1895 when James’ was only nine years old, his mother died of bronchitis and pneumonia during a cold winter, leaving James and his brothers and sister as orphans. James was the youngest of his siblings. His eldest brother, aged 25, was a soldier serving in India, while his three other brothers, aged 21 to 16, worked in Westminster; one as a road sweeper, one as a clerk and the other as an errand boy. Meanwhile James’ sister, aged 12, was adopted by their aunt. Neither James’ elder brothers in Westminster nor James’ aunt, who also paid money to help his grandmother, were able to look after James. Temporarily, therefore, James was taken into a home for working boys, St Matthew’s Home in Westminster, which was also looking after his 16 year-old brother, Robert. St Matthew’s Home wasn’t run by The Children’s Society (then known as the Waifs and Strays Society). It was a home for older boys, like Robert, who were working. At only nine years old, James was too young to stay in this home, and so an application was made for him to be taken into the care of the Waifs and Strays Society. In May 1895, two months after his mother’s death, James entered The Society’s Talbot Home for Boys in Bournemouth. Three years later in 1898 when James was aged 11 and still living in the Talbot Home, a medical certificate was filled out for him. This stated that he had a tendency to scrofula. There had been no mention of scrofula in a previous medical certificate for James, which had been completed when he first entered the Talbot Home, so perhaps James had recently contracted the disease or perhaps the symptoms had only just started to show. Scrofula is an infection of the lymph nodes in the neck which leaves them swollen; it is sometimes caused by tuberculous bacteria, but can also be caused by other types of bacteria instead. James remained in the Talbot Home until he was 12 years old. The Talbot Home looked after younger boys, and when they reached the age of 12 the boys often left the home to start apprenticeships in Bournemouth. It was considered that James wouldn’t do well in an apprenticeship and so instead, in 1898, he was moved to Standon Farm Home for Boys in Staffordshire. This home usually looked after boys until they were 14 years of age and trained them for farm work. The next we hear of James is five months later in 1899 when James would have been 13. 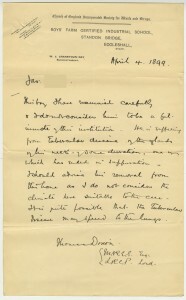 He was examined by the doctor who worked as the medical officer for the Standon Farm Home; the doctor’s report is below. which has ended in suppuration. climate here suitable to the case. disease may spread to the lungs. Reading the report, we see that James’ scrofula was tubercular and that one of the swellings on his neck had become suppurative (meaning that it had become an open wound). It also suggests that the disease could spread, leading to pulmonary tuberculosis, if it was not treated. As the doctor advised, it was considered best for James’ health for him to be removed from the Standon Farm Home, and arrangements began to be made for James to go to hospital in London for treatment. At the time, James’ elder brothers were still living in London and it was thought best for James to stay with them while he was receiving hospital treatment. And so in 1899, when James was 13, he was returned to his second-eldest brother William who was then aged around 25 years and was living in Lambeth in London. A few days later, we find that James went into St Thomas’ Hospital in Lambeth for an operation. Presumably this surgery was to remove the infected lymph nodes. The success of surgery to treat tuberculous scrofula can be variable, but before the use of antibiotics it may well have been one of the only treatment options available. Unfortunately, James’ case file ends there. 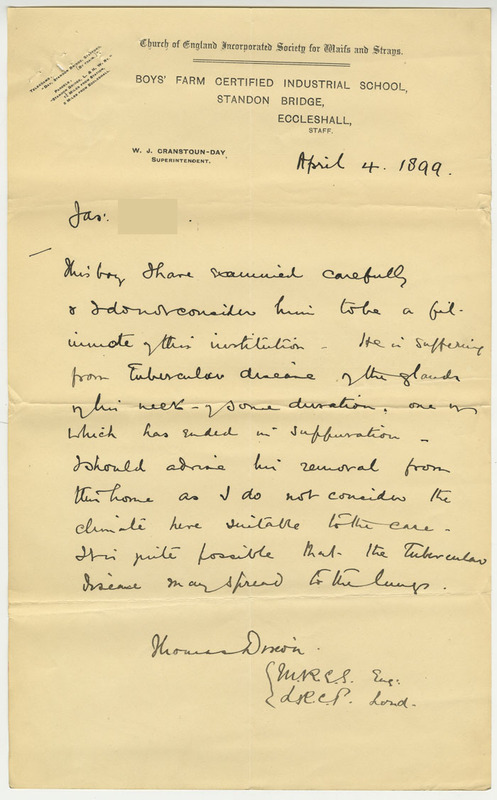 Perhaps his brother William arranged James’ stay in hospital and any later care, which could be why the Waifs and Strays Society didn’t create any more correspondence about the case. If we want to know more about how James got on, a search of the records of St Thomas’ Hospital might be able to give us the outcome of his treatment there.